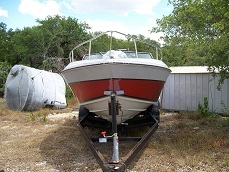 Austin Boat Forums › Lakes › Lake Travis › Boating Saturday...Anyone out? here is the crack before we started working on it. WOW. That's a bit more than I imagined.. Material doesn't look too thin. You should be able to weld that once ya figure out what's up with the welder. Gonna need some kind of filler. That's going to be the tricky part; finding some filler that's the same type of alum. Don't suppose there's some extra alum on the pontoon you could cut off..
it doesn't look thin but it is less than an 1/8" thick. they are the old style pontoon that the top is separate from the bottom. the crack is right were the bottom section is bent at 90 to bolt the top and cross members to it. we will figure it out and make it work!